A fan based series based on TheMilanTooner's The Railways Of Crotoonia series. Only a few differences between the two : This is just going to be just for fun, Until I've managed to master animation it's going to be a combination between audio and slideshow pictures, it's not going to be a paying project, there'll be some characters that don't speak or won't be making appearances in The Railways of Crotoonia, but will in Islandside Adventures. Even though there are currently lots of roles already casted, there still lots of roles that have yet to be casted. So don't be disappointed if you don't get the role you want, cause there's plenty to go around. Just do your best! No way, tin brain. 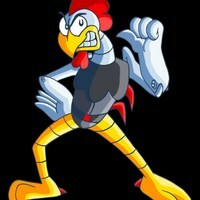 Dr. Robotnik loves me best, so it's always my turn. There's just one thing, Dr. Robotnik. 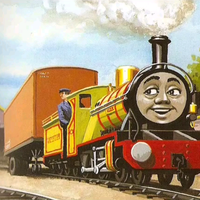 He's the newest and strongest steam engine on The Arlsdale Railway on Sodor, and one of the engines that helps run the minimum gauge railway on both Crotoonia and the resort on Pinewood Island. He has no original voice. 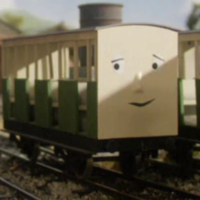 This part has been casted to : an off site YouTube user called Mike The Red Engine. Jocks? Not a bit, sir! I like the color, and the name would suit me fine. Road or rail, what do I care? That's alright. I"m sorry too. It's silly trying to get the better of each other. If I hadn't teased you, perhaps your injector wouldn't have failed. It taught me a lesson : on railway, it's teamwork that counts. Morning, boys! You have a lot of work to do today to keep Gridinia Bay running on schedule. Listen up! I've just been told that there's gonna be an inspection this afternoon from the navy before that new naval freighter arrives. You all know what that means. Bluenose'll be sticking his bow into everything, so I want you all to be on your best behavior................especially you, Oliver. Zorran, Zebedee, and Oliver. I have a special job for you. A large order of petrol is waiting to be picked up at the B.U.R. Shipping Company dock and deliver it to the refueling dock here in Gridinia Bay. It was supposed to arrive here by rail, but all the engines are too busy to bring it. 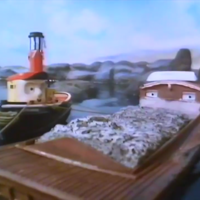 And those goodie goodie Star Tugs and the Ocean Tug & Salvage Company tugboats are too busy running Celgreb Bay and Grofflen Harbour to bring it here as well. 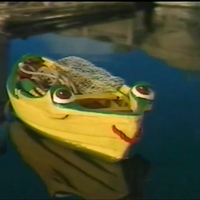 So, I'm relying on you three to bring it back here before sunset, or the ships here in the harbor won't have enough fuel to depart with their passengers and freight to their destinations outside of Crotoonia. 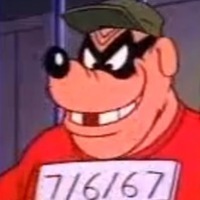 As near as I can figure, we've hit Scrooge's money bin two hundred and ninety nine times. Uhh uhh, thanks. Those aren't bon bons, Burger. Their boom booms. "Use these to escape tonight. Then meet me at the old Lorange theater. Signed, El Capitan". I don't know who this El Capitan is, but I sure like his.....style. Yeah. But first we gotta get out of here. Can't I have just one? (yawns before speaking) Well, three hundreds' the charm. Uhh, look Big Time. They add note. Uhh, Big Time. This place gives me the creeps. 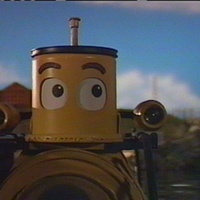 She's a visiting mini sub that often travels with Stewiacke all over the world in the show Theodore Tugboat. She has no original voice. Where is Northumberland? I can't wait to see him! Northumberland's gonna take me underwater exploring in the harbour! 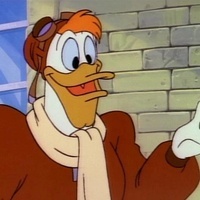 He's a pilot from the 1987 version of Ducktales. 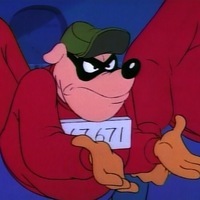 His voice should sound like Terry McGovern. Hi Hank. I really don't know. They were right here a minute ago. Probably just an old sailing ship. Vikings never came to this harbor. No, Hank. I'm hot, and these bumpers are heavy. Let's, let's just get our work done. Hi Theodore! What are you doing? I wanna go fast! The faster the better! You know everything! It must be nice to be bigger! 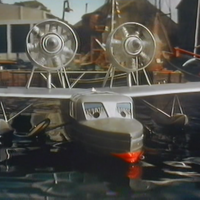 She's a seaplane from the old classic show TUGS. Her voice should sound like she does in the episode "Sunshine". Her original voice is unknown. Hello, Ten Cents. Who's your new friend? Thanks for the fuel, fellas. 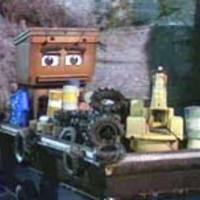 She's an oyster barge from the classic show TUGS. Her original voice is unknown. Oooh! What a horrid engine! He's bumped us! Let's get back at him! They're from the show Thomas and friends. They have no original voices. Have to be able to do different voices for this role. We're coming along! We're coming along! Oh, we do like him. Stop! Stop Stop! You've left the refreshment lady behind! I'm the fastest steamroller in the world! 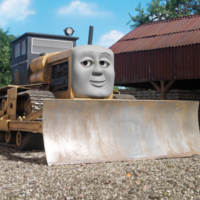 He's a bulldozer who worked for The Sodor Construction Co., but now works for The Crotoonian Construction Co. He has no original voice. 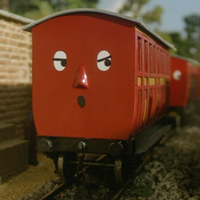 This part has been casted to : an off site YouTube user called Mike The Red Engine. Look at that! A work of art! What do you think of my trench, Oliver? I don't need help! Try Kelly The Crane! Hello moo cow! 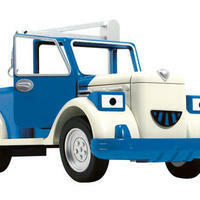 I'm Dodger, the new milk delivery truck! I hope to get this milk delivered on time! 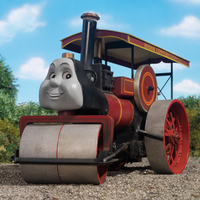 He's a tractor from the show Bob The Builder, that now works up at the farming village known as Celgreb Fields on Thomas' Crotoonian Branch Line. 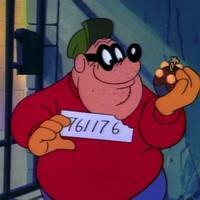 His voice should sound like either his U.K. voice Rob Rackstraw or his U.S. voice Alan Marriott/David Menkin. 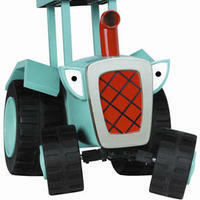 Travis Tractor's my name, and packing is my game! Oh, I'd better hurry! Toby'll be arriving to collect this load of hay from the halt any moment. Sure thing. I'm on my way!